Guest post by Samantha. If you want to guest post too, see the requirements here. So you only recently paid attention to the buzz surrounding the HBO hit-series Game Of Thrones, and it sounds like something you’d totally watch, but you’re a season behind the current action. Also, you’re intimidated by all the media coverage of the series that describes the series as dense, complex, rich with dozens of characters, and filled with countless settings. Don’t be intimidated! The series is much more approachable than critics would have you think, and it’s definitely worth your time to watch. That being said, I should warn you: when you start the first season, you will feel intimidated at the sheer number of plots and characters introduced within the first half hour. But don’t despair! The writers of the show do a great job of explaining events and characters as the show progresses. If you want a little extra help understanding people, places, and events in Game of Thrones, consider this straightforward (and spoiler-free) primer. Game of Thrones is primarily set on the fictional continent known as Westereos, a world imagined by the author George R. R. Martin, whose books—collectively known as A Song of Ice and Fire—serve as the source material for the series. Westeros is a fantasy realm set in a medieval time, where lords and ladies rule territories, knights fight for honor, and hardships abound for the vast majority of peoples without means. the continent is divided up by the various royal houses that rule them, and are collectively called “The Seven Kingdoms,” all of which swear fealty to the king, Robert Baratheon, who lives in the southern part of the continent in King’s Landing. The Seven Kingdoms are varied at unique, each one dominated by the distinct personality of their ruling house. For instance, the Lancasters rule the Midwestern area of the continent, whose capital is Casterly Rock. To the north is the wintery land ruled by the Stark family (who are the main characters of the series), and to the very south of Westeros is a desert like country of the Dornish ruled by the rich Martell family. Though The Seven Kingdoms are at peace at the opening of the series, they all have a history of waging wars among each other, for many royal family want to consolidate their power and extend their influence. To the north of the Seven Kingdoms is the Wall, a huge structure miles long that spans the icy northern wilderness. Much of the series takes place along the Wall, as this is where strange events occur that lead those who defend it, the Night’s Guard, to think that trouble is stirring which could threaten the whole kingdom. The story begins during a relatively peaceful time in The Seven Kingdoms. Robert Baratheon has ruled for some years since leading a rebellion to oust and kill the then-king, whose daughter and son (Daenerys and Viserys, respectively) are now on the run in a continent outside of Westeros and serve as main characters of the series. 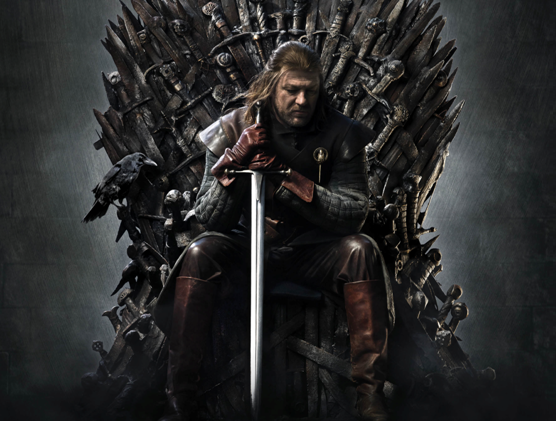 The events of the pilot episode are sparked by a death in King’s Landing of the king’s most trusted advisers, which causes him to travel north to ask the head of the house Stark, Lord Eddard Stark, to become his new adviser. Thus the pilot episode focuses on the goings on at Winterfell, the seat for the royal family of Stark as they prepare for the arrival of the king. You’ll meet a seemingly endless array of characters in the first episode, but there are two main houses to keep in mind as you watch: the Lannisters and the Starks. These two houses are diametrically opposed from the very start, and their conflicts serve as the impetus for many of the events in the series. The Lannisters are a powerful and wealthy family, and Cersei Lannister is the queen of The Seven Kingdoms, married to Robert Baratheon. The Lannister’s wealth, cunning, and elitist attitude have made them the most powerful family in the realm, and none of them are happy at the prospect of doing business with the northern Starks, a comparatively modest and humble family. The events that unfold between these two families in the first episode will almost definitely make you want to watch the next episode and the one after that. It’s a lot to take in for a one-hour TV show, but the characters are complex and the stories are fascinating, so why not give the series a try? This guest contribution was submitted by Samantha Gray, who specializes in writing about online bachelors degree. Questions and comments can be sent to: samanthagray024@gmail.com.